The clutter in your home most likely didn’t happen over night. No one pulled up with a dump truck and dumped it into your home. Nope. Most likely you brought things into your home a little bit at a time. And over time, it became more than you anticipated, more than you wanted, and taking up more of your home than you intended. It's time to stop clutter from coming into your home. Don’t bring it in! Don’t buy anything you don’t need, even when it’s on sale, a great deal, or even free! Do you really need it? Do you really want it? Do you love it? Will it help improve your life? Do you have somewhere to put it? Do you already have an item just like this? Just saying, stop and think before you bring something home that’s going to end up just being more clutter. One in/One out. For every item you DO end up bringing something into the home, set another item free! Especially if it’s a new item that you already own, say, a new pair of shoes. Then, get rid of a pair of shoes. If you bring in more than you purge, the clutter is going to catch up and take over. You need to get rid of more items then you bring into your home. Put your things away! Give everything a home and when you’re not using it, put it in its place. I swear that this rule alone can make a huge improvement in the organization of your home. And obviously, or not, if you don’t have a home for something, then you better find one or out the house it goes! You know what they say “a place for everything and everything in its place.” It’s so true, and important! 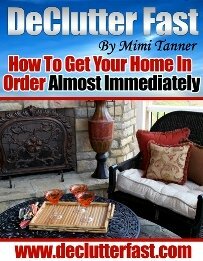 Now that you know how to stop clutter, please feel free to browse around and find out how to declutter what’s already in your home and how to organize what you choose to keep.